Eating out in Edinburgh was such a fun experience. We got to try several independent places with their cozy or fine dining atmospheres, but as it was our honeymoon, we also went to places that we’d seen before and wanted to try! One such place was Coast to Coast. (Coast to Coast will be referred to as C2C from this point on!) There is a C2C on Riverside in Norwich which we had seen a few times so when we saw one in Edinburgh we decided to give it a try. The fact that we ate our starters before I got a picture probably says a lot! I had the slow baked ribs with dry bbq rub and the most delicious homemade coleslaw I’ve had in a long time! Joshua had Boston Prawns – “Large tiger prawns hand battered in our Samuel Adams® beer batter, served with Cajun mayonnaise on the side.” I got to try a bit – and it was yum! Perfectly cooked with a nice crunchy batter. Such a simple dish and it was done really well. For our main course, Josh and I, decided to have fajitas. We haven’t had them in a long while but when we first moved in together last summer we ate them quite a lot as they were quite easy to make! It was nice because it brought back “moving in memories”. These fajitas were fantastic. They came sizzling on their platter and accompanied by dinky pots of cheese, guacamole, sour cream and salsa. The chicken was char grilled – I didn’t read this on the menu and if I had I may not have ordered this one.. I’m not a big fan of the char grilled flavor. I also don’t like bbq’d food either but that’s a story for another day! It’s just a personal preference but I like more delicate flavors and that charred effect just, to me, tastes just burnt. Now that’s not a negative about C2C as everything was cooked really well and the onions, peppers etc that came with it were fantastic. Just not really for me! Josh’s was really good as his also came in bbq sauce – always a winner! 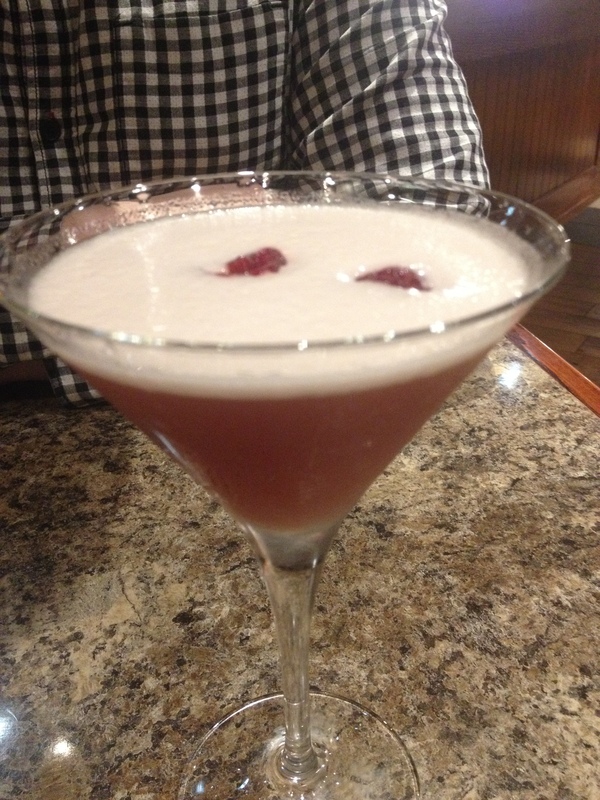 Now the next thing I want to share with you are the cocktails at C2C – I could not recommend these enough! 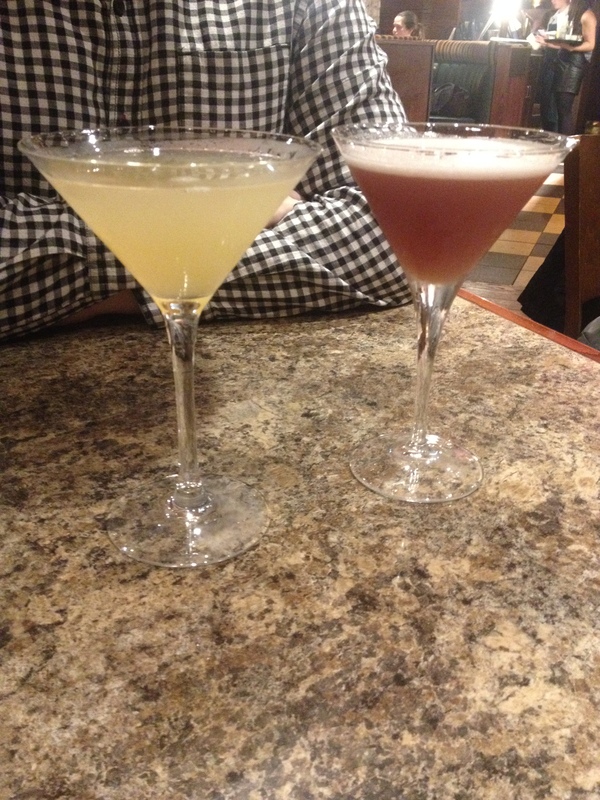 My first cocktail was called a French Martini (the red one in the pictures!) and was described on the menu as “Eristoff vodka, Chambord and pineapple juice, shaken to give you a smooth fruity finish”. I chose this one because I recognized Chambord which I had bought as a Christmas present for Josh’s Dad last year. Chambord is a black raspberry liqueur which I really liked the sound of – plus I am obsessed with pineapple juice! I even made my own in my juicer! This cocktail was exactly how I thought it would be, a touch dry but with a soft, fruity finish – YUM! Joshua had an appletini. Described as “A perfect pre-dinner Martini. Eristoff vodka shaken simply with apple schnapps and fresh apple juice. Dr. John Dorian loves them!”. Josh is a massive scrubs fan and I don’t think he’d ever had an appletini before so this was the most obvious choice for him. I think he really enjoyed it because he finished every last fruity drop! After our meal we definitely did not have room for dessert! But something had caught Josh’s eye on the cocktail menu. Now I would agree with the menu which described it as “not for everyone” but Josh ordered one, I had one sip and ordered my own – it was that good. But only if you like Reeses Peanut Butter Cups – because this is exactly what this tasted like! We loved it – the digestive biscuit round the rim of the glass was such a good touch and even though it contained vodka and chocolate syrup, the main flavor was the peanut butter which was really good! This was a really fun drink which we really enjoyed. You can find your nearest Coast to Coast on their website and if you like peanut butter I thoroughly recommend giving the Peanut Butter Martini a go!